Who Is the Green Hornet? 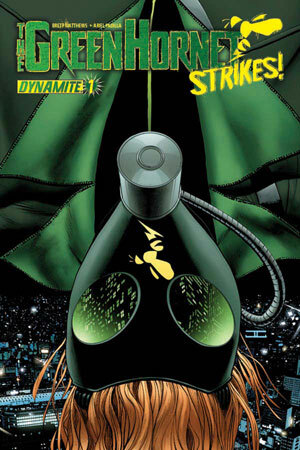 As Britt Reid is about to sell the secret identity to Chicago’s current crime boss, a new Green Hornet is trying to infiltrate the headquarter of Gregor Kaast. Will the Green Hornet arrive in time to save Britt Reid or will Kaast murder the former Green Hornet first? This issue is set in the near future, but the only way to tell is to read the blurb at Dynamite Entertainment’s Web site. It should not be so and thus this series will confuse casual readers that do not follow these things as closely and that also pick up the other Green Hornet series by Kevin Smith. The plot is a typical Green Hornet boss, with the hero or an aspect of him challenging a local crime boss. The plot is also too close to the one in the regular Green Hornet comic book series by Kevin Smith where an older Hornet again, foolishly gave up his life for his replacement. Still it’s interesting to follow the antics of this geeky Green Hornet and see how well he fares without a Kato as back up. The artwork is good and solid and adds to the sense of awe when the issue opens. All the action is not always clear though. Is this series needed? I’ll this should have been the regular Green Hornet series instead of the one by Kevin Smith. There’s more action in that one issue than in the three I’ve read so far by Smith.